"Looks like pumpkin, tastes like pumpkin, but it's butternut squash!" In a blender or food processor, combine butternut squash, brown sugar, cornstarch, egg, milk, cinnamon, allspice, cloves, ginger, and nutmeg. Process until smooth. Pour into the unbaked pie shell. Bake in preheated oven for 50 minutes, or until a table knife comes out clean when inserted in the center. The butternut squash worked out fine and I like the idea but this recipe was FAR too spicy. I tried again with half the spices and it was still too strong for me! This is the best Pumpkin(squash) Pie I have ever made & I`m an old woman! I have been making pie for 50 years. 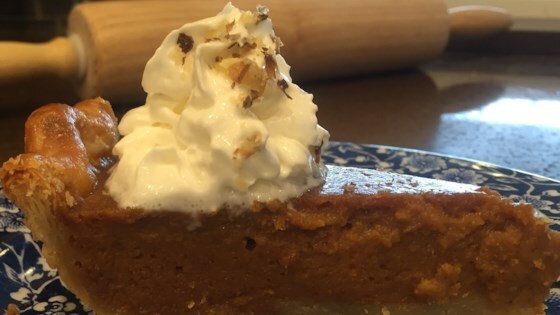 This is a great pie.I added some pumpkin pie spice,1 teaspoon.for one batch ,I used egg beaters and fat free evaporated milk,It came out great.